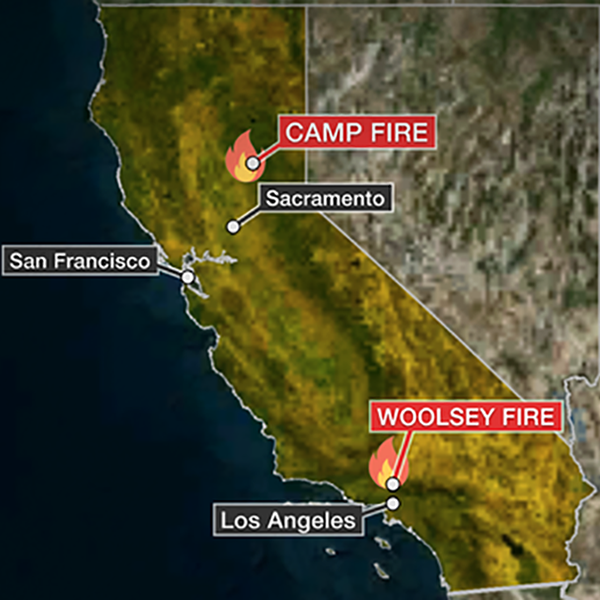 Over the past week, two major wildfires have been spreading across California, forcing thousands of people to evacuate their homes and burning tens of hundreds of acres of land. In Northern California’s Butte County, “Camp Fire” has burned more than 130,000 acres, killed at least 56, and destroyed more than 10,300 structures (including homes) since it started on November 8, making it the deadliest and most destructive wildfire in California history. At the time of this report, the fire was only 35 percent contained. In Southern California’s Los Angeles and Ventura County, the “Woolsey Fire” has burned nearly 100,000 acres, killed at least 3, and destroyed 435 structures, with 57,000 still in danger, according the local officials. That fire, which was also ignited on November 8, is 52 percent contained. “These wildfires in California continue to rage. We need your prayers,” tweeted Southern California pastor and NRB member Greg Laurie on Monday. Among the NRB member organizations responding to the fires are Convoy of Hope, which has been sending supplies to its hub in Chico, California; Samaritan’s Purse which has staff on the ground in Northern California with a disaster relief unit; and the Billy Graham Rapid Response Team, which has deployed chaplains to the Northern California area. Also responding is Somebody Cares America, which is partnering with other organizations and area churches in a variety of ways, including sending N95 masks to distribute in the areas where air quality from the fires is poor, as well as providing Somebody Cares bears for children impacted by the fires. On November 19, Somebody Cares’ founder and president, Doug Stringer, will be traveling to Thousand Oaks in Ventura County to meet with the mayor-elect and other leaders who are dealing with fire relief as well as the aftermath of the recent mass shooting in which 12 people were killed by a lone gunman. The mayor-elect is also pastor of a local church. On the other side, NRB members are also among those impacted by the fires, including Roger Kemp & Company (RKC), which has had to close their offices in Westlake Village due to safety concerns. “Due to the threat on local neighborhoods over the weekend, most of the RKC staff was under ‘mandatory evacuation,’” RKC’s president, Roger Kemp, reported Monday. Please ask God to comfort those who are suffering from loss, trauma and injury. Please thank God for protecting all 16 RKC team members and their families. Please pray for us as we comfort friends and neighbors who have suffered loss. Please ask God to use our local churches to demonstrate the hope and compassion of Jesus. “The entire team at RKC wishes to express our gratitude for all those who join us in lifting these needs up to the Lord. It's our great privilege to work in Christian service in volatile times. Together, we continue declaring the name of Jesus until He returns to call us home,” he concluded.